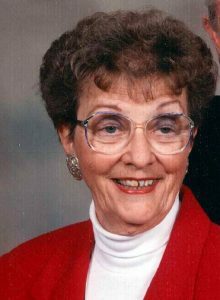 Funeral services for Emma Lou Emerick, 92, West Plains, Missouri will be held at 2:00 p.m., Friday November 9, 2018 in the Rose Chapel at Robertson-Drago Funeral Home. Mrs. Emerick passed away at 4:42 p.m., Monday November 5, 2018 at Ozarks Medical Center. She was born July 31, 1926, at Moko, Arkansas, to Amzie Conrad and Dollie Reavis Conrad. Emma Lou graduated from West Plains High School with the Class of 1944. On June 26, 1949, she was married at West Plains, Missouri, to Jack Delbert Emerick, who preceded her in death on October 16, 2012. She enjoyed all of her family and was especially proud of her grandchildren; she loved to play cards, games and telling jokes. Mrs. Emerick was a member of the First Baptist Church of West Plains. She is survived by one daughter, Christy Ingalsbe; two grandchildren Khara Moss and husband, Nathan and Shaun Ingalsbe and wife, Jackie; four great-grandchildren, Ethan Moss, Haylee Ingalsbe, Brody Moss and Logyn Ingalsbe; one sister-in-law, Bernadean Fuller; and several nieces and nephews. Her parents, husband, son-in-law, Carl Ingalsbe, three brothers and one sister, preceded her in death. Mrs. Emerick will lie in state from 5:00 until 9:00 p.m., Thursday at Robertson-Drago Funeral Home. Burial will be at Oak Lawn Cemetery. Memorial Contributions may be made to St. Jude’s Children’s Research Hospital and may be left at Robertson-Drago Funeral Home. We want to extend our deepest sympathy to you and your family upon the loss of Emma. She was always friendly, nice, and concerned about our family particularly Corby. We will miss her! Each one of you will be in our daily prayers/thoughts. May God comfort, encourage, and support each one of you through this difficult time. May God bless each one of you. Christy, Allen and I send our heartfelt condolences at the passing of your sweet mother. Thinking of you and Khara and Shaun this evening. Christy, I’m so very sorry to hear about your sweet Mother. My prayers and thoughts are with you and your family. Christy, I am so sorry to hear about your mom. I enjoyed visiting with her at Pleasant Valley. I am sending you prayers for comfort. Christy, we are so sorry to hear about your mom. No doubt, Heaven has gained another angel. Prayers for you and your family. Christy, I am so sorry for your loss, my thoughts and prayers are with you and your family. We are so sorry about your loss. She was one of the nicest lady we know. We enjoy playing cards with her at the Senior Center. We never seen her get angry. She was so cute. When you played a high card and she had to pay a point on it, she would stop and say, “why did your do that and laugh”, then play her card with a smile. She will be missed by many. Prayers are with you and your family.